This magnificent tapestry of floral art, the vertical gardens and floral labyrinth created from more than 200,000 potted plants and flower beds covers an area of 60 rai (9.6 hectares) and is set against the picturesque backdrop of a midst shrouded-valley. 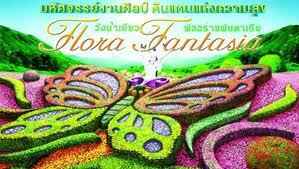 This promises to rival the floral magic seen at the various world-famous international flower shows. Top artists will also be taking part in the event and will be presenting floral works of art as impressive as the ones created with a paint brush. Additionally, a scenic vantage point provides the perfect spot for photography. It looks like it is a magnificient event. Maybe you can show some photos to enjoy it those who can not visit the place. I put a video from the event in 2011.